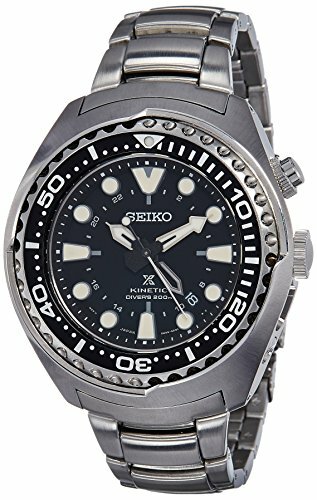 Seiko SUN019 X Prospex GMT men’s dive watch features a 48mm wide and 14mm thick solid stainless steel case with one way rotating elapsed timing bezel and textured screw down crown with a function pusher. Seiko SUN019 is powered by movement of body with an accurate Japanese 5M85 kinetic quartz movement. This stylish watch also features a sharp looking black dial with cream LumiBrite accents silver tone luminous hands and hour markers along with the GMT indicator, 12/24-hour time and 6-month power reserve indicator function once fully charged and date display function, scratch resistant anti-reflective coated sapphire crystal and water resistant to 200 meters (meets ISO standards and is suitable for scuba diving).